Perspiration (Lat. per, through, and spi-rare, to breathe), the watery secretion exhaled by the perspiratory glands of the skin. These glands consist of one or more cylindrical tubes, lined with glandular epithelium and arranged in the form of a convoluted globular coil, situated in the subcutaneous connective tissue immediately beneath the cutis. From each gland an excretory duct passes directly upward in a nearly straight course through the cutis, and afterward in a strongly spiral course through the cuticle, terminating by a very minute and oblique opening upon the surface. 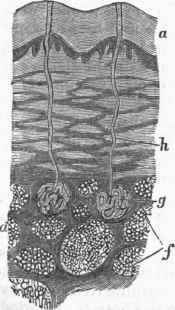 The tubular folds of the perspiratory gland are surrounded by a close network of capillary blood vessels, from which the watery and saline ingredients of the perspiration are exuded into the cavity of the tube, while others are perhaps formed by the secreting action of the glandular epithelium. The fluid thus produced accumulates in the glandular tube, fills its excretory duct, and is finally discharged upon the surface of the skin. The importance and quantity of this fluid may be estimated from the numbers and extent of the glands engaged in its production. On the posterior portion of the trunk, thighs, and legs there are about 500 perspiratory glands to the square-inch of skin; on the anterior portion of the trunk, the forehead, neck, forearm, and back of the hand and foot, about 1,000 to the square inch; and on the sole of the foot and the palm of the hand, 2,700 in the same space. According to Krause, the number of perspiratory glands over the whole body is not less than 2,300,000; and as each tubular coil, when unravelled, is about 1/15 of an inch long, the entire extent of glandular tubing is not less than 153,000 inches, or about two miles and a half. - The perspiration consists mainly of water, holding in solution various saline substances, such as chlorides, sulphates, and carbonates, a volatile acid body, the precise nature of which is not fully determined, and odoriferous animal matters which give a peculiar smell to the perspiration. Under ordinary circumstances the perspiration is produced and discharged in such moderate quantity that it becomes volatilized and escapes by evaporation as rapidly as it is poured out. It does not appear therefore as a visible moisture upon the skin, and is known accordingly as the " insensible transpiration." But when the circulation through the cutaneous vessels is excited by exercise, warmth, or other causes, the activity of the secretion is increased, the fluid is poured out in greater abundance than it can be disposed of by evaporation, and it therefore appears in standing drops of perspiration, or in an abundant layer of moisture diffused over the surface. The principal office of the perspiration is to regulate the temperature of the body, and particularly of the integument, by preventing its rising above the natural standard. Although the temperature of the blood and the internal organs is, as a general rule, 100° F., that of the skin is less than this, usually about 98°. The integument is constantly losing heat by its exposure to an external atmosphere which is generally much cooler than itself, and its temperature is thus kept down to the proper level notwithstanding it is constantly supplied with warm blood. But when the external temperature rises to 80°, 90°, or 100°, or even higher, the perspiration being poured out in greater abundance, evaporation goes on more actively, and the abnormal heat is thus expended in the vaporization of the watery fluid, the integument remaining at or near its own natural temperature. A high external temperature therefore becomes uncomfortable only when the skin remains dry, or when the atmosphere is already overloaded with moisture, so that evaporation is interfered with. But when the perspiration is freely discharged and readily evaporated, a man can bear without discomfort an external temperature much higher than 100°. The amount of perspiration discharged during violent exercise has been known to rise as high as 5,000 or 6,000 grains an hour; and under the combined influence of muscular exertion and a high external temperature, it has been found considerably greater than this. Under ordinary circumstances, the average amount of perspiration discharged by man in the course of 24 hours is nearly two pounds avoirdupois. Perspiratory Glands of the Skin, seen in vertical section. a. Cuticle, d. Subcutaneous cellular tissue, f. Lobules of fat in subcutaneous cellular tissue, g. Perspiratory gland, h. Excretory duct of perspiratory gland.